Folks, the results are in. After a year of caring for pooches of all shapes and sizes, Mad Paws has revealed the 100 Top Dog Names of 2018. The list stems from a database of over 300,000 Australian pets, and is Australia’s largest ever pet index. From thirst-piquing drinks to names you’d find in your Facebook friends list, this list draws inspiration from some surprising places. We also unveil Australia’s most popular dog breeds, but don’t expect to find an Oodle in the top three. Want to see if your dog’s name or breed rated a mention? Read on! For the third year in a row, the name Bella claimed the title of Australia’s most popular dog name. Indeed, with the exception of Victoria (in which Charlie proved to be the #1 top dog name), Bella earned the top ranking in every state and territory. All hail Bella. Long may she reign. 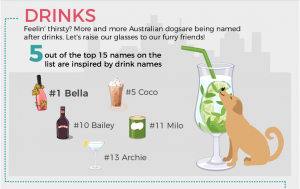 In a thirst-quenching turn of events, Australia saw a shift towards drink-inspired dog names in 2018. In fact, one third of the year’s Top 15 dog names were inspired by drinks. Interestingly, this pattern doesn’t continue among the lower ranked names. This suggests that, as far as dogs and drinks are concerned, Australian Dog Owners have an “all or nothing” policy. Condiments also made a cameo, with “Pepper” and “Chilli” taking the 32st and 95th spots, respectively. 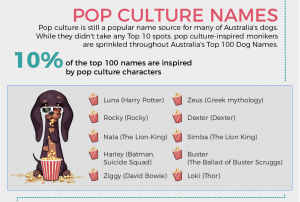 Compared to previous years, the popularity of pop culture-inspired names saw a decline. Amidst the Top 20 Names, pop culture references were conspicuously absent. However, pop culture does still hold some sway over naming choices in the Top 100. When it comes to surging trends among dog monikers, 2018 saw a tidal wave of human names. It’s a pattern that walks hand-in-hand with the growing role dogs play in the lives of their Owners. With more and more Millennials opting for animals over children, dogs are increasingly evolving into companions for their Owners. As such, Pet Owners are now humanising their dogs more than ever. By the same token, classic dog names suffered a sharp downturn in prevalence. 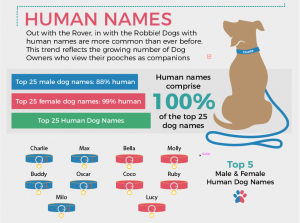 The usual suspects, such as “Rover” and “Fido”, didn’t earn a single ranking in the 100 Top Dog Names. While Poodle-crosses have dominated breed lists in the past, it was the ever-loving Labrador Retriever that took 2018’s top spot. Moreover, larger and more outdoorsy dog breeds enjoyed a surge in popularity across the board. This follows 2016’s “micro dog wave”, which was a response to more compact living conditions for the average Australian. The prevalence of more outdoor-oriented breeds could suggest a move towards a more active lifestyle for the average Dog Owner. Below we’ve listed 2018’s top dog names. If you grew up in Australia, you could be forgiven for thinking you were looking at your high school year book. Have you just brought home a newly named dog? Are you looking for a bit of help while your furry friend settles in? Book a Mad Paws Dog Sitter today! Why Don’t Dogs Like Rain? How Can I Massage My Dog?